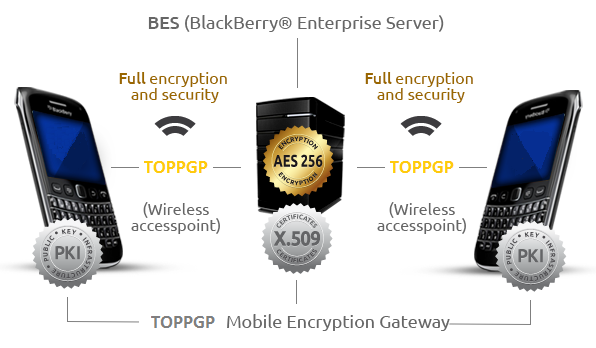 TopPGP is the only company in the world that offers encrypted BlackBerry® devices with 3 layers of encryption. In addition to the BES BlackBerry® encryption and standard S/MIME support package, we have built a Mobile Encryption Gateway. This is a closed system. Users can only communicate to other TopPGP S/MIME MEG BlackBerry® devices, not to any other random BlackBerry® device nor to other BlackBerry security platforms. BES is the business model of BlackBerry®. Large corporations and government organizations use this platform as it allows them to set security protocols and add additional high standard encryption to BlackBerry® devices. Infection of BES devices with third party spyware/Trojans/viruses is impossible. TopPGP BlackBerry® devices are all connected to dedicated BES servers. This implies that the protocols set on the BlackBerry® devices are designed for full protection. It is by no means possible to intercept or decrypt any data coming from a handset. In addition to the BES environment, TopPGP has integrated a dedicated Mobile Encryption Gateway (see image). This solution enables the additional usage of PKI security for encrypted communication on our BlackBerry® devices. The TopPGP solution uses standard interfaces provided by the BlackBerry® operating system. Without any workflow and application changes, the confidential transfer of messages, calendar entries and contacts is guaranteed. This solution remains completely transparent for the user. This Mobile security solution manages the user certificates and private keys in a secure keystore on the device. Authorized applications can obtain access to these certificates and keys. Binding the keystore to the device ID and the SIM card realizes a multi-factor authentication.